As longtime readers will know, my late father and I had a code phrase for leftist peacenik morons who hung out with the Palestinians (and any left-wingers who pander to Muslims): “a candidate for Lunch in Tul Karem.” We got that from the incident, several years ago, in which two left-wing Israeli Jewish activist businessmen owners from Tel Aviv were best buddies with “moderate” Palestinian Muslim restaurant owners in Tul Karem. 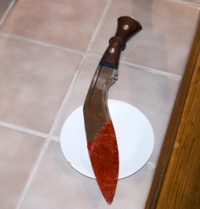 One day they went for lunch in Tul Karem at their Palestinian buddies’ food joint, and the only thing their “peaceful” Muslim friends served them was a bloody set of decapitations and amputations, probably while they were still gurgling. Their butchered bodies were sent back to Tel Aviv in a bloody mess, beyond recognition and dental records were needed for identification. “Lunch in Tul Karem” Is Not a Meal or a Place . . .
A pro-Palestinian activist from Italy who had been abducted by an extremist group in the Gaza Strip was found strangled to death early Friday, the first such slaying of a foreigner in the coastal territory ruled by the militant group Hamas. 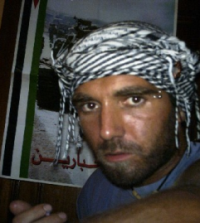 The body of Vittorio Arrigoni, 36, was discovered by Hamas security forces in an empty house in Gaza City a day after he had been seized, officials said. Arrigoni had been strangled with a plastic handcuff strip, said Khalil Abu Shamala, director of Al-Damir Association for Human Rights, who went to the scene with security officials. His head was bloodied, apparently from being beaten before he was killed. An al-Qaeda-inspired group calling itself al-Tawhid wal-Jihad, or Monotheism and Holy War, had asserted responsibility for the abduction. . . .
A YouTube clip posted Thursday by the abductors . . . said: “The Italian hostage entered our land only to spread corruption.” It described Italy, which is majority Catholic and the home of Vatican City, as “the infidel state.” . . . He was active in the International Solidarity Movement. . . . He had accompanied fishermen challenging Israeli-imposed boating limits off the Gaza coast. A well-known Israeli actor, director and political activist was gunned down yesterday in the West Bank town where he ran a drama school and community theater, Palestinian police said. Juliano Mer-Khamis was killed in his car just meters from the Freedom Theater which he had founded. Jenin police chief Mohammed Tayyim said Mer-Khamis was shot five times by masked Palestinian militants, and that Israeli security forces were still investigating the circumstances of his murder. His body was brought by Palestinian ambulance to a nearby checkpoint, and then transferred into Israel. . . .
Mer-Khamis was born in the Israeli-Arab city of Nazareth to a Jewish mother and an Arab Christian father. He served in the IDF as a paratrooper and portrayed Israeli Jews in many of his roles both in film and on stage. 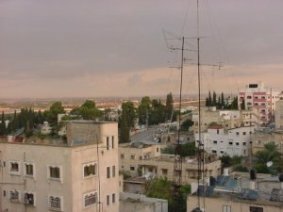 In 2006, Mer-Khamis opened the Freedom Theater with Zakariya Zubeidi, the former military leader of the Al-Aqsa Martyr Brigades in that West Bank city. Zubeidi was appointed co-theater director in an attempt to subdue the ongoing threats voiced against both the institution and Mer-Khamis. The theater itself was torched twice in the past, and the threats persisted despite Zubeidei’s appointment. Some of the criticism focused on the fact that the theater offered co-ed activities, despite prohibition in the Islamic moral code. Objectors were also outraged when Mer-Khamis staged the play “Animal Farm,” in which the young actors played the part of a pig, which Islam considers an impure animal. Mer-Khamis said he had planned to stage “The Lieutenant of Inishmore,” a satire of armed resistance, but shelved the idea after someone smashed the window of his car. So sad, too bad. By the way, guys, how was Dessert in Tul Karem? On the flip side, “peace activists” who come to Israel never return home in body bags . . . unless they come with weapons and to provoke and kill Israelis, like a scant number of the violent thugs in last year’s Gaza flotilla. But, hey, I’m sure both these violent murders by Muslims are the JOOOOOS’ fault! On a related note, many Western Woman who show up at anti Israel demonstrations in Israel and the so called “occupied territories” have been groped, viciously assaulted and even raped. The situation has gotten so bad that warnings are being made to woman who show up at these to dress modestly and be very careful. Western women are raped and sold into sexual slavery by Palestinian Arabs with the Left’s complicit approval. Don’t look for that to ever be mentioned on anti-Israel websites or the feminists to have a cow over. Women’s lives are cheap in the Muslim World and ironically enough the one country, they have full equality and freedom is Israel. Don’t ask me. Ask Hanin Zoabi. She has the kind of standing she has in Israel that she would never have in any Muslim country. But we all know who is guilty of all the sins in the world. Apparently, these two didn’t hate Jews enough. The War Against Israel is so sick, the Arabs literally fight wars against one another over how best to kill the Jews. Leftists are under the illusion that they can work with Islamists over the long-term. In the end, they are disposed of after their usefulness has come to an end, and sometimes even before. Is is like the time that Siegfried and Roy discovered that their large house cats were in fact very wild animals. The wild animals always love dining at Tul Karem. Like in Iran and more recently Egypt. The secular leftists who pushed for revolution got shoved aside by the Islamists who promptly liquidated them in Iran. It will happen in Egypt, too. But the Western Left is going to support those who want them dead right to the very end. Let’s not be obsessed by people who are going to be yesterday’s news. A century from now, no one will remember them. Which is most fitting, indeed. The Mossad hires Palestinians to kill Western anti-Israel activists to make the Palestinians look bad and the Western dummies look like the fools they are. They need to tell themselves that since there’s no accounting for human stupidity. I wish that some of our political elite would go have lunch there as well! I am going to turn on the Tee-Vee to CNN right now and get the truth about this, with all the details. And if you can’t find it there,Dr.Dale, try the BBC. Er, wait,no, better keep on looking…. CNN will give you the “truth” from the left. FOX will give you the “truth” from the right. And never the ‘twain shall meet! Just think what those Paleostinian “martyrs” have in store for them when they get to their “heaven”, which is of course, HELL: 72 Virgin DEMONS with anvil-shaped genitalia, ready to disembowel them! Sorry, it really does not work. Canned speeches and cant meant for Western audiences really do not cut it at all. Also, Salam Fayyad could not order a cup of espresso in Gaza, since Fatah was expelled from that place long ago. You also bring up the Governor of Jenin, whose denunciations of what happened in Gaza, even if sincere, are meaningless. Many thieves will smile and laugh with you before cutting your throat. You are like a magician who has performed the same trick in front of the same audience too many times. What you are engaging in, as those other you have mentioned, is simple obfuscation. Unfortunately for you, the illusion no longer works since the wild animals time and again fail to control themselves. Its amusing to watch HAMAS get all lathered up over its rivals butchering its fan boy. But then they do kill each other when no one is looking, over whose version of Islam is the strictest. And its like an organized crime family head denouncing another organized crime family for encroaching on their turf. Its the same principle at work with Islamic terrorists. Jenin governor Qadura Moussa called Mer-Khamis a great supporter of the Palestinian people. He said Palestinian President Mahmoud Abbas told him to bring those responsible for his death to justice. Like I said – its hilarious more extreme anti-Semites are taking out the human garbage for us. I can’t exactly get worked up over the death of virulent anti-Semites by even more vicious Jew-hating animals. That’s exactly what they wanted done to the Jews when they were alive and now they got served on the menu first and the irony is all their hatred of the Jews and Israel couldn’t keep them alive. As I said Debbie, it kinda warms my heart the useful idiots and pawns of terrorism got paid in full for their unstinting support of it. When you lie down with vicious wolves, don’t be surprised if they turn you. It was bound to happen sooner than later. So I’m not exactly shedding tears over their stupid choice in life. When you side with evil, you end up getting consumed by it. But don’t expect Western Jew haters and the Israeli ones to internalize the obvious lesson. Hatred of the Jews and Israel leads to no good end. That said, I have to say there is one signal service the more extreme anti-Semites in the Muslim World are doing for mankind: exposing and eliminating the weaker Western anti-Jewish phonies who believe Muslims love them! Hey, ain’t anti-Semitism grand as an international brotherhood? Yup, its better they kill each other than they kill Jews. If you really wanna know, this is one feud between the world’s Jew haters I want to see go on forever. Kinda like the fight between Predator vs Alien. When all is said and done, this is one fight in which there are no good guys. Period. Pro-Arab Leftists killed? HAHA HAHAHAHAHAHAHAHAHAHAHAHAHAHAHAHA!!!!!! Excuse me while I sing and dance. I see no reason why Jews shouldn’t celebrate. They thanked G-d for drowning the Egyptian army in the sea who would have slaughtered all of them. When a vicious anti-Semite dies, the world is a more peaceful and secure place and I’m with you there in your merriment! Vittorio was probly murdered because the ISM is very gay(very)! I would think they would encorage Italian useful idiots to continue w/ there idiotcy until they’ve gained critical mass in Italy.Maybe there just stupied or so hatefilled it dosen’t matter.The birthrate of Itallians or so low that maybe they’ve already gained critical mass. While Juliano was murdered, despite him hating his mothers people, because he was still considered a Jew. He was born a Jew. That didn’t make him one. In cases like this, I kinda wish Judaism retained the biblical patrilineal descent principle so Jews wouldn’t have to claim him. He wasn’t really a Jew where it counted. I agree w/ you NormanF. If a Christian renounces his or her faith and values ,they are no longer considered Christian.In laymans English it’s easy to express who they are and who they are not(and no longer represent). Another useful idiot Darwin Award winner, please send more of these muzzie terrorist supporters there so they can get a good taste of things to come, good riddance. I went to that anti-Zionist site this morning run by well known Jewish mamzers and they were crying over his well deserved demise! I just love it when leftist idiots have no appreciation for irony. Oh their Palestinian benefactors they adore so much will come for them someday and not in a kinda good way. They’ll never get it until its too late. It already was two of them and I hope as long I’m alive Islam, as I said, disposes of the rest of them for us. Alhamidullah (Praise Allah) – sometimes even Islamic terrorists do G-d’s work right here on earth! “sometimes even Islamic terrorists do G-d’s work right here on earth!” Amen and amen! Didn’t know if you had seen this Debbie. Just wanted to pass this along. Their death wish was fulfilled. Their lunch specials were to go orders. Its like dining with cannibals. Dining In Tul Karem results in one being served on the Muslim platter. And gee, people are still shocked when these things happen! Good for them. Reap the wind. Seriously? Did you see the Italian’s battered face, obviously scared and hurt? A reaction that says “good for them” is the same reaction that sympathizers of these radical Islamists are having right now. If your reaction to human suffering is a smug, “he got his”, then you’re part of the problem too. Do you really think these left wingers are pro-Al Qaeda? And is a guy who is Jewish himself and in favor of reaching people through art someone who is in line with Al Qaeda? How many of you other internet tough guys were combat paratroopers for the IDF like Juliano Mer-Khamis? Preaching a secular message to Palestinians in the West Bank and encouraging girls and boys to interact through acting is a moderating force, wouldn’t Israel want more moderate neighbors? Seems to me that he would be of value to the cause of people who want not only peace, but security. Its one thing not to want see a decent person suffer. We know that what happens to good people isn’t fair and it moves us to want to cherish them and hold their life up as an example to others to follow. I don’t have that kind of feeling for the folks in the I Support Murderers Movement. They help terrorists to murder innocent people and they glorify them. I hate not only those who do evil, I hate and despise with all my heart those who support, aid and abet them. Keep telling yourself there are “moderate” Palestinian Arabs. I highly recommend people read the book by the Italian journalist Guilio Meotti – he wrote a moving account of entire Israeli Jewish families snuffed out by terrorists bent on genocide – and on the courage and heroism of the survivors who had to to put their lives back together again. They didn’t ask to be killed for no other reason that were Jews. Those are the people I admire and love and the pain of their loss will never disappear from my heart. They are the people the anti-Semites you support have no human sympathy for whatsoever and if they ever get it their way, every Jew in Israel will die. I don’t care about the deaths of anti-Semites cuz I know when they get their just dessert, the world is redeemed. I just have incredible sadness when innocent Jews are handed a death sentence they never deserved. Don’t lecture to me about humanity. We’ve seen the kind of humanity the Arabs display towards their friends. I can only imagine the barbarism they would display towards their enemies. And its been a month since the Fogel family was brutally slaughtered in Itamar. People like you were nowhere to be found. The fact the depraved Jew hatred in the Arab World and Iran is widespread as it is means peace will never be possible. Your pitiful defense of folks who side with evil doesn’t in the least make me sympathetic to their condition. When you hate the Jews and Israel, it won’t protect you. The murders of two degenerate human beings proved me right. And its another reason why not listening to the likes of you is going to help redeem the world one day. Its the decent people in Israel and all those who love good and fear G-d and walk in His path who will make it come true. Not ashamed at all. You should be ashamed of your limp wristed stupidity. Did Patton feel sorry for the axis when he destroyed everything in his path? No he rejoiced. Not being smug, this is simply justice, handed down by a higher hand. Their fault wasn’t in reaching out to the sinners, but abetting them by turning their backs on the righteous. Remember, with islam, there can be no compromise. ‘Please’, as Norm pointed out, you were nowhere around when the Fogels were massacred, so if we want to celebrate the death of 2 vicious specimens of human debris, that’s our prerogative, and you can take a backpack and go hiking to… Tul Karem. Or for that matter Gaza, Ramallah, Cairo, Benghazi or wherever else you wish. No, but Patton thrashing Nazis does not equate to Al Qaeda torturing and killing some misguided left-wing “peace activist”. You people do realize that you are cheering on Al Qaeda, right? The Italian was clearly an attention whore, but where do you extrapolate that he aided and abetted murder by advocating pacifism? In a tangential way his support of the Palestinian cause could provide some sort of moral support to Hamas, but I would think Israel would want a pacifist Gaza. Now, that said, would this guy ever be successful at influencing Hamas towards pacifism? Of course not. But shadow, you think this was justice? Handed down by a higher authority? Really? Because I thought it was an Al Qaeda linked group that killed him because he was European and secular. I guess according to you, Al Qaeda is inspired and guided from above. I am sure they believe that too, so you are in agreement with AL Qaeda in that their act is divinely inspired. Nice. Norman, you are a wack job. Not only do you conflate the activities of these two victims with that of terrorists, you suggest that I support anti-Semites who would kill every Jew in Israel. Why don’t you find some quote from those two that suggests they ever supported anything remotely like that. BTW, I am the first to applaud when I hear an Israeli F-16 took out a Palestinian bomb maker, those are the people that have genocidal aims towards Jews and Israel. These two can in no way be compared to that. If you don’t think that there are moderate Palestinians, then what is your solution? Are they born radical, is every Palestinian a radical Muslim who wants all Jews to die? What then, kill all of them, including children, peace activists, secularists, Christians, or do you just want to target everyone who is a Muslim? If so, that’s a strategy strangely similar to one that Jews faced in Europe. I’ll agree with you on one thing. Jew hatred in the Arab world is widespread, which is why it must be overcome. Last I checked, Israel was SURROUNDED by Arab countries, and the territory within its state AND the areas in occupies is MAJORITY Arab. Ultimately, there will have to be peace, and there is past precedence for it, so I don’t believe perpetual conflict is inevitable. Shadow, I agree with you %100 that there is no compromise in Islam, but that doesn’t mean there is no compromise in individual and collective Muslims. Participants in every religion make compromises. The Christian religion is uncompromising in its tenet of non-violence and turn the other cheek philosophy, but Christians have compromised on that point for centuries. In fact, Muslims will have to live with an Islam that makes compromises if they want to thrive in this world. As to the Fogel family massacre, there can be nothing more heinous. The groups that did that act share the philosophy of those that committed these recent killings. @please: If al quada takes out garbage I don’t care how they do it. It’s gone and that’s fine with me. When I hear about an earthquake in Iran, I also don’t shed a tear. I suppose in your world, I’m a bad guy for that as well. I did donate $$ to the Japan relief effort, as well as other WORTHY charities. As far as destroying evil, I’m rockin’ out to it. The enemy of my enemy isn’t my friend in this case but I don’t care if predator takes out alien. When will people learn that Pacifism and ultra relativism are more fatal than it is beneficial to one’s political/personal agenda? Many people have fallen victim to pacifism.If you continue to show sympathy for the Devil and deny the true sadistic nature of the beast, you will vilify those who are compassionate and merciful towards you.The Arab doesn’t discriminate against the infidel.He holds all kafirs as being equally worthy of mayhem and destruction.As far as the Bedouin is concerned, you are good as dead.All the tireless efforts you put into helping his causes goes unappreciated.The day when you no longer have the ability to distinct (or confuse with rather) your enemies from your friends is the day you fall victim to pacifism.The people who indoctrinated you with left wing principles, for better or for worse,are to blame. They are unable to save you from the lethal clutches of the Arabs that you fell into. All they can do is promote the Stockholm syndrome and encourage you to try to relate to the ruthless captor who seeks to kill you.But its all hopeless when the sword is slicing through your neck.There is no escape.Its too late to reconsider your agenda and reconcile with yourself. Of course Jews will inevitably be blamed for the murder of these activists as they were in the past.Perhaps Mel Gibson should have played the part as Miral. OK ‘please’, how about justice guided by a higher hand? I simply mean when do they kill someone it’s not some innocent family in their sleep but one on their own side. These men were more than just “misguided peace activists”, they knew exactly what they were doing. BTW, Most despot lunatics are famous for disposing of their own allies when they stop being usefull, so nothing new there. “WITH islam there can be no compromise” – I’m sure there are many Muslims who would prefer secular rule, (did ALL the population of Egypt rebel against Mubarak?) but as long as islam is in charge those who would support Israel could never do it publicly for fear of repurcussions. True islam rules by an iron hand. There will never be a permanent peace as long as islam exists. Sorry, I just can’t see it happening, no matter how hard we wish for it, no matter how hard some misguided peace activists try. Islam only understands force, and History has proven it. When will people learn that Pacifism and ultra relativism are more fatal than it is beneficial to one’s political/personal agenda? Many people have fallen victim to pacifism.If you continue to show sympathy for the Devil and deny the true sadistic nature of the beast, you will vilify those who are compassionate and merciful towards you.The Arab doesn’t discriminate against the infidel.He holds all kafirs as being equally worthy of mayhem and destruction.As far as the Bedouin is concerned, you are good as dead.All the tireless efforts you put into helping his causes goes unappreciated.The day when you no longer have the ability to distinct (or confuse with rather) your enemies from your friends is the day you fall victim to pacifism.The people who indoctrinated you with left wing principles, for better or for worse,are to blame. They are unable to save you from the lethal clutches of the Arabs that you fell into. All they can do is promote the Stockholm syndrome and encourage you to try to relate to the ruthless captor who seeks to kill you.But its all hopeless when the sword is slicing through your neck.There is no escape.Its too late to reconsider your agenda and reconcile with yourself.You may hate Jews or disapprove with our rules of engagement.That is fine with me.I don’t hold any personal grudges against you.But please note that the Jewish kapos were also gassed by the Nazis after betraying their brethren to them.If you think that the Arabs won’t lay a finger on you after protesting with them,then you are fatally mistaken. Indeed, the pro-Palestinian activists hate Israel far more than they hate Arab Muslim barbarians who commit the most depraved of atrocities. They explain it away and when the proof is undeniable they still blame Israel for something it had nothing to do with. Let’s face it, those folks don’t give a damn about the Arabs. Its just convenient foil for good old fashioned anti-Semitism. They could care less the Arabs are caught between the Stalinist repression of Assad and the medieval barbarism of the Islamists. The Arab Spring appears to be taking a turn for the worse. If anything emerges, it won’t be democracy, tolerance and freedom. The Middle East will revert back to the Dark Ages. for those for those want the Jewish State to sacrifice itself to stave off the inevitable Islamic takeover in their own countries. Here’s a news flash: Israel is not going to commit national suicide. Get used to it! You apparently haven’t been deeply acquainted with their beliefs and their unstinting support of those who want to destroy Israel. And when such people side with those who do, it implies they share that genocidal philosophy. A pacifist? Please, stop embarrassing yourself. Real pacifists love all people and are opposed to all violence. The Italian guy who was murdered supported the mass murder of Jews by identifying with the Islamists. That didn’t save him. I don’t mind being called a wack job for pointing out the difference between decent people and those think evil is cool. And yes, the vast majority of Arabs would murder every Jew in Israel if they could. What keeps Israel safe isn’t a piece of paper. The Arabs and the Jews are completely different and the twain shall never meet as long as the Arab World is filled with sick Jew hatred. That isn’t going to disappear in our lifetime. Facts are stubborn things and all the wishful thinking of the Left won’t change them. The same could have been said about Poles, Russians,Germans, as well as Spaniards circa the 15th century. Much of Christian Europe would have seen Jewry destroyed, and Hitler of course nearly achieved it. The fact is, not so long ago, Jews were seeking shelter in places like the Ottoman Empire, Morocco, and Syria. In the middle ages through mid-20th century Jews suffered far more at the hands of European Christians than they ever did Arabs. The ground in Europe is soaked with the blood of Jews from pogroms and massacres. Yet today, Germany is one of Israel’s biggest supporters, and while antisemitism in Europe is on the rise, there is no fear of state organized mass murder or ethnic cleansing. My point here is that I am sure that many thought that there would never be any reconciliation between Christians and Jews, that it would be impossible, yet look at today. It should be important for Arabs and Jews to remember their shared history, after all, Sephardic Jews fled to places like Morocco after being forced from Spain. This is not to say that dhimmi status means equality. But for people on all sides who think there is no historical precedent for peaceful coexistence, they are forgetting hundreds of years of history. The fact is, history moves on, and people and cultures change for better or for worse. I am well acquainted with the belief systems of Islamic fundamentalists and the groups that want the destruction of Israel. Clearly, there are many that will not change, and those must be fought and confronted. These groups’ ability to exist doesn’t come from the fringes, it comes from the mainstream that sympathize with them, and here maybe we are in agreement. Where we’re not is that there are people that can steer the mainstream away from sympathizing with radicals, by providing different platforms and narratives by which people can connect. That’s why these two were killed, because they were advocating a different kind of civil position, and that’s why their deaths shouldn’t be chuckled at. Even if you were right, those are positions the Arabs reject. They are not interested in peace, not now and not for decades. Perhaps never. The depth of Jew hatred is simply too great a factor to be overcome – and Jewish niceness towards those who hate them won’t change their minds. There is not a single concession Israel could make to induce this anti-Semitic mass psychosis currently gripping the Arab and Muslim World to disappear. Its not the Jews’ fault peace won’t happen in our lifetime. You lie down with dogs. You get up with fleas. Please: Germany is NOT a supporter of Israel, you peacenik moron. Please, I am simply amazed at your wishful thinking, I will tell you how it ends, it will be total war between us of the West and the the muzzies of the east. There is no moderation of islime and if you think the so called moderates will give Israel peace you are clearly deluded. The West will have to eventually have come to Israels defense out of neccessity because the muzzies in our midst will wage war against us. You can never appease these koranimals, force will be the rule of the day soon enough. The dead Pali panderers? Poetic justice. Germany? Sadly, relative to other European nations, Germany is actually a little less anti-Israel. Yes, Mike, about half believe that Israel committed grave crimes against the Palis, but in the cesspool that is Europe, that actually puts Germany near the top of the heap in favorable-to-Israel ratings.